I was never much of a whiskey girl until JD started getting into Scotch years ago. Dating a lover of Scotch opens you up to trying new things. I have sampled more whiskey than I can think of and know things about it that impresses/concerns my mother, like that Highland Park 15 has a nice note of vanilla that is considered a defect. 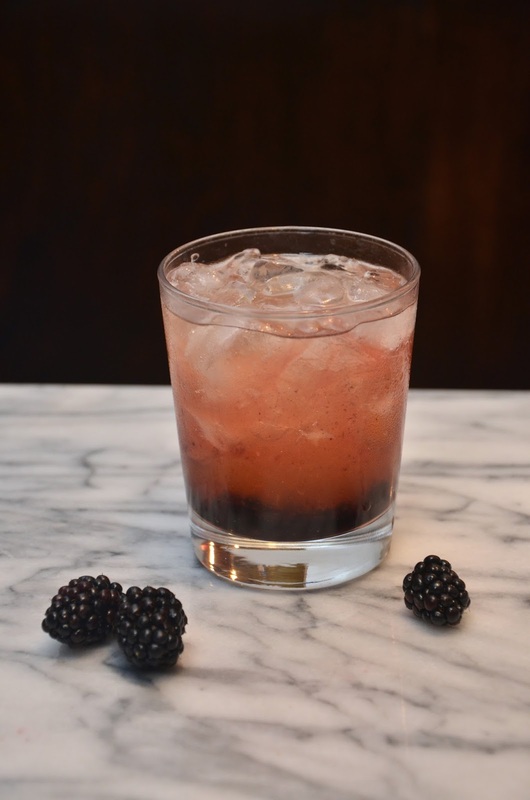 Last weekend while discussing what drink to do next, JD and I scrolled through pinterest and landed on some kind of fizz muddled with blackberry jam. 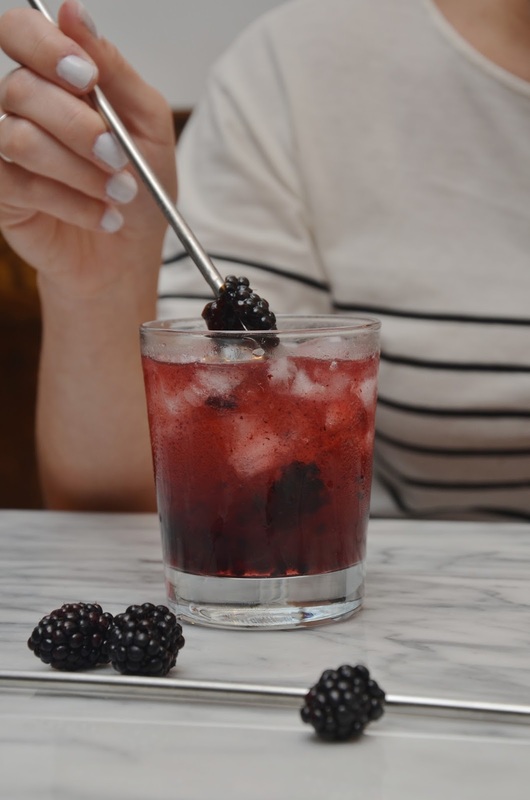 I thought it would be too soon to do another fizz after the blueberry lemon one two weeks ago (you can check out that recipe here) so I began thinking of what else might be good with blackberries. My mind immediately went to bourbon and so we continued searching until we found a vague list of ingredients on a restaurant website and as per usual made up our own version. In a small saucepan add equal parts sugar and water and a few cardamom pods and bring to a boil. Reduce heat to low and simmer for about five minutes. Strain or remove the pods and let cool before adding to the cocktail. In a large glass or shaker muddle half a lemon with bourbon and cardamom simple syrup. 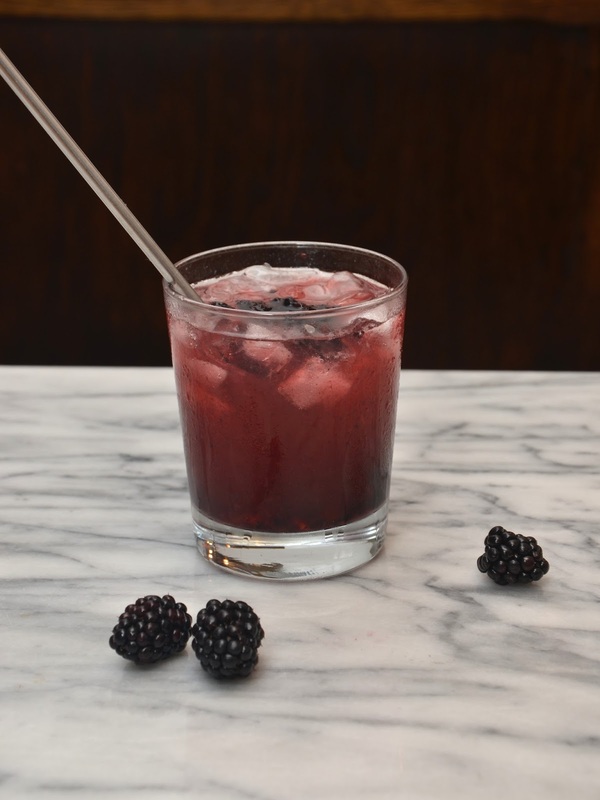 In the serving glass, muddle blackberries and fill with crushed ice. Strain and pour bourbon mixture over ice and top with soda water. Stir and enjoy! We were going to add champagne but forgot to pick some up so ended up adding soda water instead. I'm kind of disappointed about that. I'll take just about any excuse to have champagne so please feel free to switch that out if you like! Happy Friday and enjoy the holiday weekend (if you have one)! This sounds different. I like the idea of blackberries. A fun cocktail for an end of summer bbq! I'm married to a scotch drinker as well, who happens to be from Kentucky. So bourbon and scotch are his staple drinks. No matter how many times I try I just haven't liked it, except for Mint Juleps during horse racing ;) This sounds delicious though, I"ll have to try! Oh another fun drink recipe! Looks delicious and beautiful! Your photography is excellent and I can't wait to try this recipe out! i would GLADLY drink this. I'm not much of a scotch drinker, but this looks really good! Your drinks recipes always look delicious and the photos are so pretty! Yup... you're making me want a drink right now! This sounds delish! Yay thank you! What a great recipe and I have been searching for some simple delicious cocktails, that I could make for special evenings and this seems perfect! Were headed to the beach soon and this will make a great treat for the hubby and I. Every single drink you post here always looks right up my alley!! I must confess I am not a whiskey fan, but I would give it a try! and champagne sounds even better - hopefully next time you will have it on hand :) Have a wonderful weekend! Another inspiring cocktail :-) I love your manicure! oh god, i need this now. Ok, just by reading the title of this blog post, made me want to make this drink. And your pictures make it that much better! My mouth waters by looking at these black berries! The beverage is so refreshing! I so need this in my life right now. Great post. This is just brilliant. Exactly what I need to face the fact that today is September. This looks absolutely scrumptious, can't wait to try it!! !